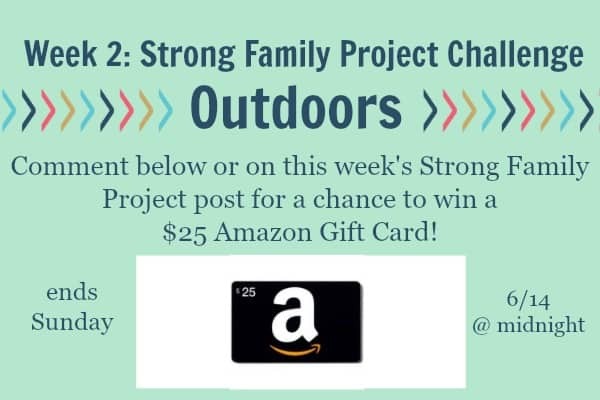 It’s week two of the Strong Family Challenge and it’s time to try new things with the family outdoors. Yes, every family needs to spend time together enjoying the season and making memories. What are your plans for this summer? Well, I just started planning mine and can’t wait for outdoor fun we have planned! From hitting the beach, to walking in the park or just enjoying an ice cream, there’s so many outside activities to maintain and strengthen the family unit during this sizzling season. Plus, this summer, I’m focusing on frugal fun. Let’s be real; making wonderful memories doesn’t have to cost a lot of money! So take your Mom’s Summer Survival Guide, your calendar, and pen, and let’s start planning our outside fun! Your eyes need to see the water and your feet want to touch the sand (at least mine do), and it’s time to plan that long-awaited visit to the beach or lake. As you take each family member into consideration, remember that everyone has something valuable and important to contribute to planning the trip. Plan together snacks, entertainment and even beach games. The fun does not start on the water, but in your home as you plan your adventures. If you have a pool at your house, it’s time to clean it out and dive in. If you don’t have a pool, sprinklers are great fun too, and the cost is minimum for maximum enjoyment! Kids (and grown ups too) love the water in this season. Have a movie night under the stars by making a giant movie screen. Here’s a great tutorial from Wholesome Mommy that will make this project a reality! Take a trip to the ice cream shop and buy a favorite ice cream/sweet treat for the family. Instead of taking the order to go, sit outside and have intentional conversation while enjoying a delicious treat. Conversation is a great way to start strengthening your family bond this summer! 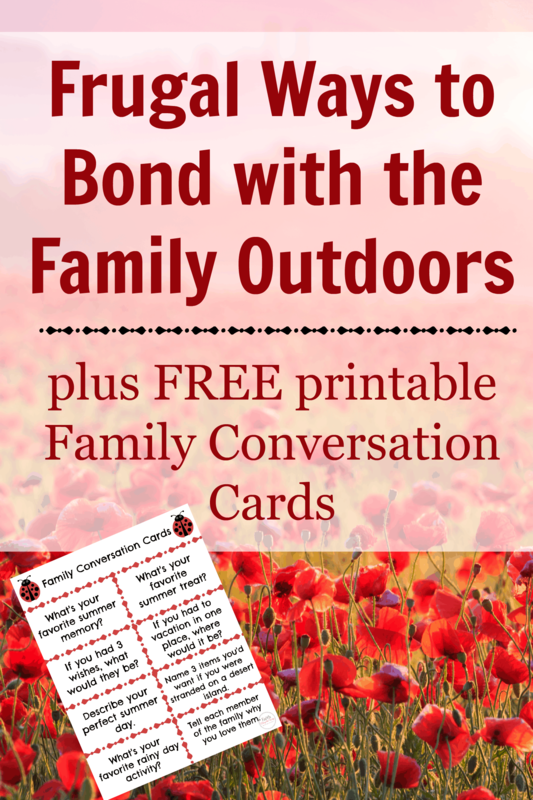 Create an atmosphere of trust and open the lines of communication with these easy conversation cards. The park is another fun frugal family activity and the activities are endless! Plan a schedule of games, including old favorites such as jump rope, hopscotch, and Simon Says. Visiting an historical site is a perfect activity for the family. Not only is it fun, it’s something you can do together to discover new things. Is there a historical place near your home you can easily visit? Or is there a site in a nearby town or state you want to see? Education is a fabulous reason to take the family on a road trip! Consider visiting your state capitol, and check out the National Registry of Historic Places for other must-see sites near you. Let’s celebrate and give thanks to God for the seasons that He has given us to spend with our family. Let’s be intentional and take full advantage to unite, strengthen and grow the family in every opportunity we have. 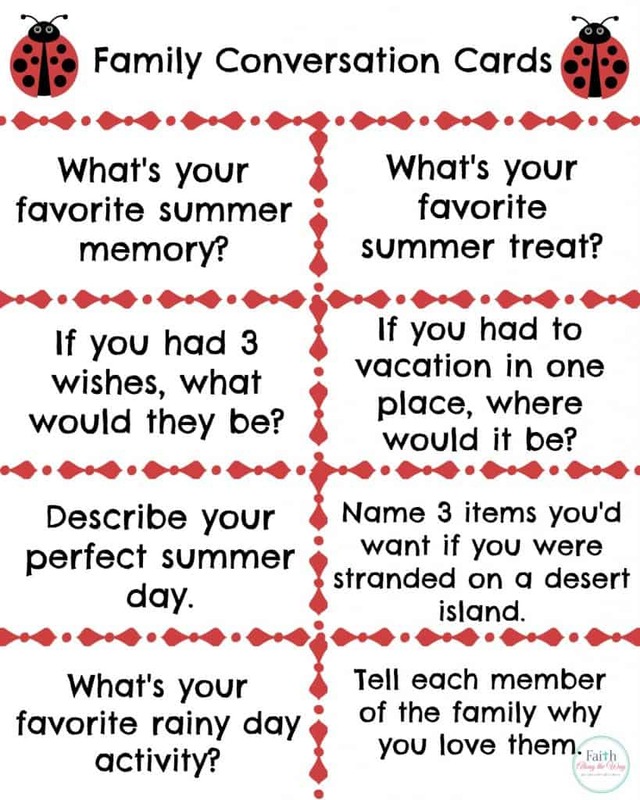 What are your favorite outside summer activities? How do you keep outside adventures frugal and affordable? Congratulations to Maria Hass, the winner of last week’s Strong Family Challenge! 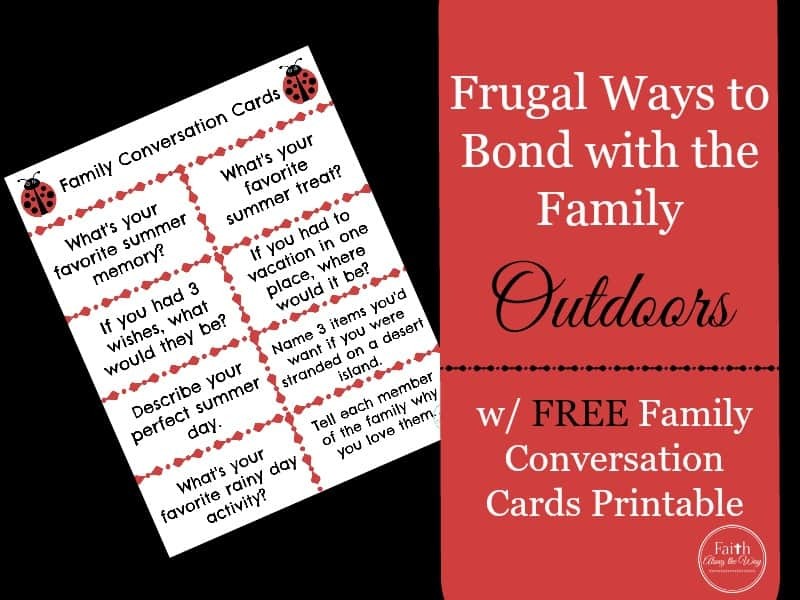 Leave your comments below or on Facebook regarding your favorite way to bond with your family outdoors, and you could win a $25 Amazon gift card this week! Tayrina is passionate for the Word of God. She loves to read and write. Sitting in quiet place with her Bible and some encouraging books it’s her favorite hobby. She’s the blogger behind TGAWrites and loves to connect and share faith every where she goes. Tayrina is married to her husband Jesus (3 years) and has a step son. She currently lives in Puerto Rico. You can find her at TGAWrites “Words of Comfort for your Heart” and A Tiny Mix Of, where she shares and mix faith & art. Sarah, thanks for having me collaborating with you in this great project! Blessings! Thank you so much for sharing your hear with us! Hugs! I love spending time at the beach (which only happens a few times a year) or by the pool at my parents or in-laws. Our kiddo loooves the water, it’s one thing that will occupy him for hours! I agree! Anything water related and that could take up our whole day. I LOVE it! Thanks so much for the fun, frugal ideas, Sarah Ann. Blessings to you and yours for a wonderful summer! Thank you, Heather! May the cards (and these easy ideas) bless your family this summer! Enjoy! Great ideas! We are starting our summer activity challenge and I would love to incorporate some of your ideas! Hope you have a fun and active summer! Thank you so much, Kelly! I look forward to checking out your challenge! It’s a pleasure to meet you! This is great, and the printables will be so nice to have. I just love this series! Thank you so much! My kids are grown, but I have two grandchildren and as a teacher I have summers off. One day during the week we have “Grammie date.” On my Thankful Fridays post each week I write about our date and where we go, what we do. Last week we visited a botantical garden, the week before that was the zoo. This week my grandson attended summer camp with me at my school while his parents took his sister one-on-one to the beach. Next week I have her one-on-one for the week. So I consider myself lucky to be able to do it all over again with my grandchildren. That’s a special time! Enjoy! Either taking walks or time at the cabin! Love the family conversation cards. Great way to spend some time talking and away from the electronic devices. Thank you! May they bless the families that use them! These are great ideas!! I can’t wait to do some of them!! Wonderful! I can’t wait to hear about the fun times you have! We have a huge glass jar I’m going to place these cards in and have each child taking turns picking at least one a week! What a fabulous idea! It’s always fun to start a new tradition with the family! My family really needs to spend more time together. Thank you for the wonderful ideas to share with my husband. Well, enjoy your time together, whatever you choose to do!